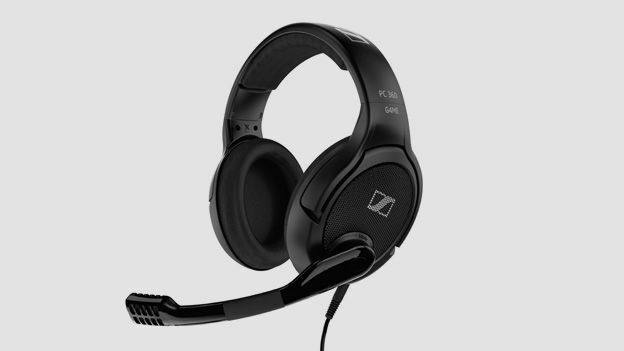 Can Sennheiser make inroads into the gaming headset market with its PC 360 G4ME? Sennheiser has ruled the headphone market for decades, and is now entering the gaming headset world. So, does the Sennheiser PC 360 G4ME cut the mustard? Sennheiser is the brand which is most synonymous with headphones – the vast majority of DJs, for example, still swear by its HD-25s, which have been around for over 20 years. But the company was in danger of being overtaken by lesser-known rivals as far as gaming headsets are concerned – the rise of Xbox Live and the Sony Entertainment Network have catapulted online gaming into big business these days. Compared to the likes of the Creative Labs Sound Blaster Recon 3D Omega and the Gioteck EX-05), the Sennheiser PC 360 G4ME may be a late entrant, but with a price-tag of £130, it aims to make a splash in the middle of the gaming headset market. But does Sennheiser's good name and reputation count for much when it's up against specialist manufacturers? The PC 360 G4ME, as you would expect from Sennheiser, is a pretty handsome object, with a giant, very chunky microphone boom that handily has a bit of flex in the middle. But its most striking aspect is two absolutely massive earcups, with an open-back design which is supposed to give your ears a chance to get a bit of airflow. Unlike the Creative Labs Sound Blaster Recon 3D Omega and Gioteck EX-05, it's a wired, as opposed to wireless, headset, but at least it has a good 15 feet of wire. Padding on the earcups and the bottom of the headband has a pleasantly velvet-like feel and, while the plastic that forms its main body isn't the most tactile you'll ever come across, it certainly feels robust. Its only disappointing design aspect is a volume knob recessed into the right earcup. While it's easy to find and operates quite loosely, it looks and feels a tad flimsy. There's is one other cool design element, though: flip the boom microphone up, and it mutes automatically. The upside of wired gaming headsets is that they're inevitably easier to set up than wireless ones: they don't require dongles or the like. Indeed, the Sennheiser PC 360 G4ME keeps it super-simple, with standard jacks for headphone and mic, and nothing else to worry about. Or at least, so you would imagine. But the Xbox 360's quirky design means that you're best off investing in an adaptor that fits into the audio outputs on your controller, presuming you prefer to attach your Xbox 360 to your TV with an HDMI cable. Connect the headset to a PC or Mac couldn't be simpler, at least, although it will be at the mercy of the quality of the sound card in your computer, unlike Creative Labs' (more expensive) Sound Blaster Recon 3D Omega. It would have been nice if Sennheiser had included an Xbox 360 controller audio adaptor with the headset, although admittedly you can pick them up for under a fiver. If there was one word that you would imagine Sennheiser's designers had in mind when they sat down to sketch out the PC 360 G4ME, that word would be “comfort”. The huge earcups and velvety cushioning combine with plenty of adjustability to fit all conceivable sizes and shapes of human heads, and feel very nice to wear indeed. The open-back design does indeed allow air to flow through, which is a slightly odd sensation at first – and, of course, it lets you hear everything that is going on around you, which could be a good or bad thing depending on your point of view. If playing games for sustained periods is your thing, though, this gaming headset was clearly designed with you in mind. With the PC 360 G4ME, Sennheiser is clearly eyeing up the vast hordes of World of Warcraft players, or devotees of other MMOs. Sennheiser has been making headphones for long enough to know how to make them sound good, and that's very much the case for the PC 360 G4ME. We won't go into the technicalities, but open-backed headphones are supposed to have inherently better sound-quality characteristics than closed-back ones, and that's easy to believe when you plug in the PC 360 G4ME. They sound phenomenal, with deep, rich bass, clearly defined mid-range and sweet, crisp treble. But there is a drawback as far as gamers are concerned: the PC 360 G4ME doesn't support 3D sound. You do still get a bit of 3D effect from simple stereo separation, but that doesn't let you distinguish incoming sounds with pinpoint accuracy so, if you're into first-person shooters, you should buy something else. However, there are plenty of other types of games, and the PC 360 G4ME will easily meet your sound-quality requirements if you're fond of MMOs, driving games and so on. Plus they are great for listening to music and films, which an increasing number of us now do via our consoles or PCs. With its lack of 3D sound and open-back design, the PC 360 G4ME is a mixed bag. However, its comfort, easy-mute microphone and great sound, plus the way it has been designed to facilitate sustained periods of gameplay means it is particularly ideal for those who spend more of their lives playing MMOs than they would care to admit.